That moment when you realise there is an age-old profession for people who want to tell others that their way of thinking is the best. 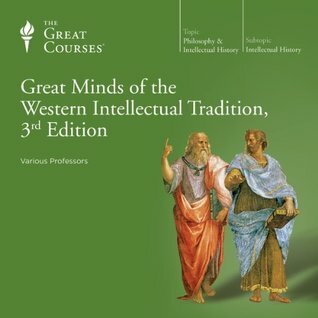 Great Minds of the Western Intellectual Tradition is an 84 lecture course on Western Philosophy. It covers the usual suspects while drawing in contemporary or subsequent criticisms, and it also adds in a few more modern thinkers (see links below for the full list). There is the added benefit that no one lecturer covers more than a few topics, so you get many perspectives and expert insights. I’ve been on the road a lot lately and so +40 hours of audiobook seemed like a suitable way to keep myself entertained. There is also a good chance I learnt something, even if that thing was that even university lecturers pronounce Satre and Nietzsche incorrectly, just like everyone else. It’s hard to offer up a substantial review of such a diverse mix of topics, lectures, lecturers, and background reading. I think some of the material was presented without enough critical examination (e.g. Nozik’s propositions are only dealt with on a superficial level and aren’t critiqued for how easily they would break down thanks to power accumulation), whilst other parts offered insights I wouldn’t have made otherwise (e.g. Nietzsche’s Ubermensch is clarified as being about “your best self”, which makes his work much more palatable). The summary I’d offer is that I feel more educated. Do the course and you’ll understand how hilarious that sentence is.